Marines of 45 (RM) Commando in Osnabruck, Lower Saxony, Germany, April 1945. The Marines are armed with Bren guns. 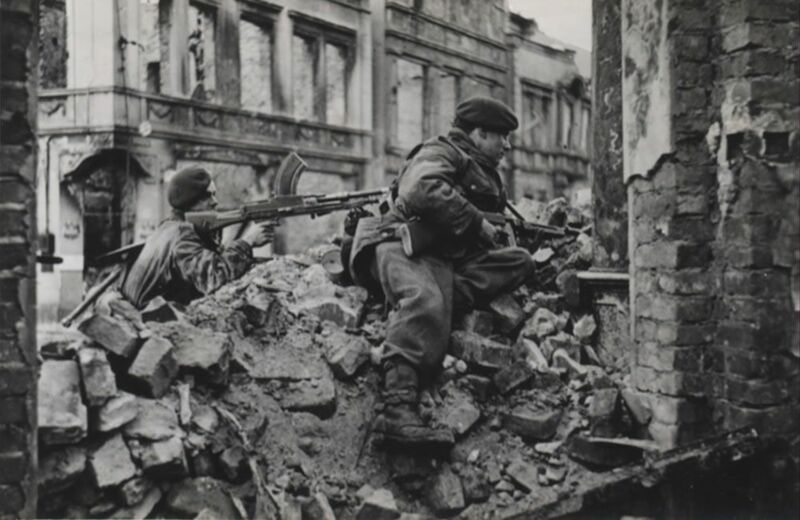 The photograph is captioned: left to right: Commando F Manders of Radway, Warwickshire and Corporal R J Angus of Bristol on the look-out for snipers among the ruins of Osnabruck, 4 April 1945. This Marines of 45 (RM) Commando in Osnabruck, Lower Saxony, Germany, April.. Art Print is created using state of the art, industry leading Digital printers. The result - a stunning reproduction at an affordable price. Marines of 45 (RM) Commando in Osnabruck, Lower Saxony, Germany, April..